^ a b  Proclamation of Constitution of the Federative People’s Republic of Yugoslavia, 31. 1. 1946. ^ a b c d e f g h i j k l m n o p q r s t u v w x y 久保慶一 (2003年10月10日). 引き裂かれた国家―旧ユーゴ地域の民主化と民族問題. 日本、東京: 有信堂高文社. ISBN 978-4842055510. ^ Duncan Wilson, Tito's Yugoslavia, p. 40. ^ Lampe, John R. 2000. 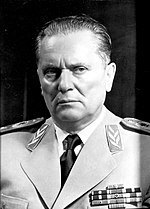 Yugoslavia as History: Twice there was a Country. Cambridge: Cambridge University Press, p321. ^ a b Death of Yugoslavia. British Broadcasting Corporation (BBC). 1995. ^ Ramet, Sabrina P. 2006. The Three Yugoslavias: State-Building and Legitimation. Indiana University Press. p598. ^ Death of Yugoslavia. British Broadcasting Corporation (BBC). 1995. ^ Beyond Dictatorship January 20, 1967. ^ Still a Fever August 25, 1967. ^ Back to the Business of Reform August 16, 1968. ^ 木村元彦 (2005). オシムの言葉 - フィールドの向こうに人生が見える. 集英社. ISBN 978-4797671087.